Summary: Scott and his merry band of filmmakers have robbed him of everything that made him great. Ridley Scott’s timing couldn’t be better. In a week that’s seen a new Prime Minister assuming power thanks to a political system that has failed its people, it’s strangely appropriate to be reminded of England’s most famous outlaw. From the film’s opening scrawl citing a ‘time when kings were tyrants’ to the story’s central theme of individual liberty and the importance of rulers listening to their people, Scott’s take on the legendary figure offers plenty of moments to provoke chuckles of contemporary recognition, and perhaps even hopes that we had our own Robin Hood in action today. But whether we would want this Robin Hood, or Robin Longstride, as he is renamed here, is debatable. The trailer promised a version of the story that we’d never been told before, and Scott and writer Brian Helgeland make good on that claim; this story ends where most previous tellings have begun, with Robin declared an outlaw and hiding out in Sherwood Forest. But Scott’s film also inadvertently makes plain why this part of Robin’s life is usually confined to backstory; it’s not that interesting, and Robin himself doesn’t actually do much in it. We’re used to seeing Robin Hood as a decisive leader of men and a dashing romantic hero, but here he is redrawn as a man carried along by the tides of circumstance, a small pawn in a much bigger political game. This may well be a truer historical depiction of the real Robin Hood, if there ever was one, but it’s not the stuff of enduring cinema. For all his drawling Americanisms, Kevin Costner’s version of Robin, in 1991’s great fun Prince of Thieves, earned his place in movie history by firing that flaming arrow in slow-motion and making that heroic roof-top dive through a stained-glass window. 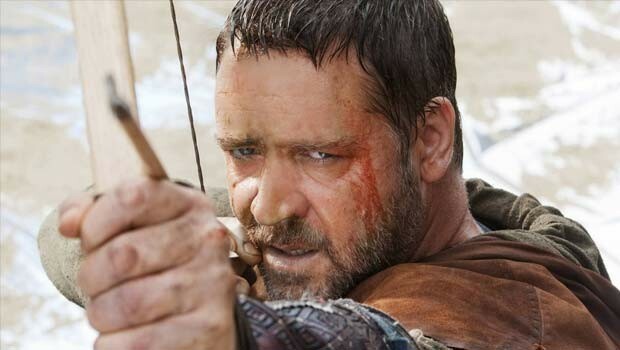 The Robin that we meet here (Russell Crowe, excellent as always) has none of that heroism or heart. That’s intentional of course; Scott is trying to show us what made Robin change from a man living only for himself to a man willing to live and die for his woman and his people. The problem is that, in the larger historical context that Scott offers, Robin’s story just doesn’t seem like such a big deal. Unsurprisingly, it’s in creating that larger context that Scott really succeeds, because he is a truly great film director, and given a big enough canvas he can bring a whole world to life. He has that canvas in 12th Century England, and he establishes the world with the same structure as he did in Gladiator; a huge, brilliantly depicted battle, followed by a mass of scenes that set up the fraught political situation in the country and skilfully introduce us to all the story’s main characters. There’s a lot of drama and intrigue to enjoy, and a host of great actors, including a fantastic Max von Sydow, playing it out. Ultimately though, all this compelling background can’t make up for the gaping hole at the centre of the movie. Robin is a bystander in his own film: both Matthew Macfadyen’s Sheriff of Nottingham and Mark Strong’s villainous Godfrey are hardly aware of Robin’s existence, giving him no great enemy to conflict with, while his courtship with Marion (Cate Blanchett) is forced – literally – and fledgling, giving him no passionate romance to pursue. In their efforts to do something new and different with the Robin Hood character, Scott and his merry band of filmmakers have robbed him of everything that made him great.